The Arctic will continue to militarize — but it will also remain a place where Russia cooperates with the West, says a leading Norwegian scholar. Sometimes there is much solace in cool analysis. Listen to this: Russia is likely to continue as an active and willing partner in the Arctic for a long time to come. There is little or no reason to fear that disagreements between Russia and the other Arctic states (all of which are NATO-aligned), over Crimea, Ukraine, Syria or other current crises will lead to Russian withdrawal from cooperation in the Arctic, be it the Arctic Council, the Arctic Coast Guard Forum or other structures. I got this from Lars Rowe, head of Russia studies at the Fridtjof Nansen Institute in Oslo, one of Norway’s finest independent research institutions, named after Norway’s great polar explorer. In 1922 Nansen went on to become the first UN Commissioner for Refugees and to receive the Nobel Peace prize for securing the exchanges of 400,000 prisoners of war between Russia, Germany and Austria-Hungary and for his relief work during a 1921 famine in the Soviet Union. “I think cooperation in the Arctic will continue,” he says. “The Arctic Council is not a structure where many decisions are made. It is a consultative structure, a forum still relatively unaffected by the tension between Russia and NATO. The Arctic Council is also an arena where Russia can project itself as civilized and willing to cooperate without having to face any extensive consequences. I don’t see any reason why Russia would want to provoke any change,” Rowe says. “One has to understand that it is the UN Convention of the Law of the Sea and not the Arctic Council that has provided Russia — and Norway by the way — disproportionate advantages in the form of access to large tracts of ocean, oil, fish and so on in the Arctic. It is in Russia’s obvious interest to stick diligently to the Law of the Sea. As long as development in the Arctic happens within this framework, Russia will find cooperation to be in its interest, and there is no reason to believe that the other Arctic states will want to change the framework since it provides them with exactly the same kind of advantages,” he says. As if to signal their agreement, the five states bordering the Arctic Ocean — Russia, the U.S., Canada, Norway and Denmark/Greenland — at a meeting in Greenland in May reconfirmed their commitment to the Law of the Sea. Russia’s claim to the seabed in the central parts of the Arctic Ocean overlaps with Denmark’s and Greenland’s claim by a whooping 650,000 square kilometers, but also in this case Russia seems happy to solve the issue by the rules of the convention. Rowe and I meet in one of Nansen’s old suites with ancient chairs and tables, oil paintings and a view to Nansen’s grave in the adjacent park. As we speak, Norwegian media report how GPS signals for aircraft in the airspace over Norway’s Arctic north were jammed during October and the early part of November, most likely by Russian forces in exercises just across the border. 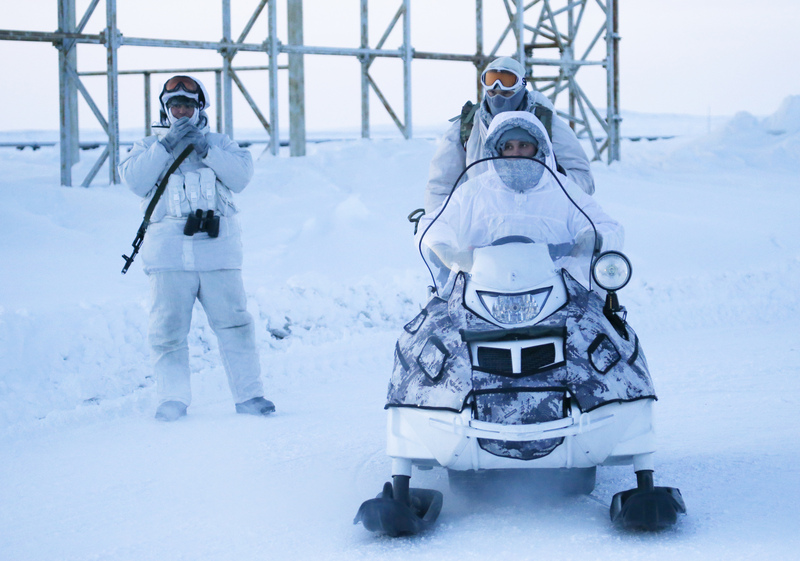 Russia has been modernizing its military installations in the Arctic for long. Russia’s Northern Fleet boasts a series of new submarines and weapons systems and old bases has been refurbished all along Russia’s formidable northern coastline. The question is whether this gives reason to worry? Are we looking at an understandable desire to guard new economic activity — oil, gas, minerals, fish and shipping — or is all this military activity really designed to install fear and trepidation within Russia’s potential adversaries? Rowe, a historian, recommends analysis based on longer trends: “I believe we are talking about modernization of Russian forces in the North to a level that Russia will regard as natural and in line with what they had in the Soviet era. The rebuilding goes back at least 15 years where we began to see more Russian bombers on strategic flights along the Norwegian coastline. At first, these were highly surprising to Norway, but in fact they represented only a historical normal,” he says. Already in 2017 Lars Rowe warned his fellow Norwegians not to interpret Russia’s current actions in light of the unusual years just after the collapse of the Soviet Union, where Russia was uncharacteristically open and more eager to reform. “In a historical perspective Putin’s centralized Russia is far more normal than the decentralized chaos of Boris Yeltsin. Likewise, international Russian self-assertion is far more normal that Russian inaction,” Rowe wrote in Ottar, a Norwegian journal. “Such operations are of course very uncomfortable for Norway, but we have to understand that a tangible measure of Norwegian discomfort is a central element of normal relations between Norway and Russia. We should not forget this: It is the discomfort that causes the elements of appeasement in Norway’s politics towards Russia and these are important to Russia,” Rowe says. Norway joined NATO in 1949 but also hurried to placate Russia by declaring that it would never allow NATO bases or storage of NATO armaments on Norwegian soil. Later, Norway showed a strong commitment to cooperation with Russia at all levels of society, Rowe explains, and the government in Oslo still demonstrably pursues this dual set of priorities: cooperation at both the level of civil society and state-to-state as in the Arctic Council and through joint management of fisheries in the Barents Sea. And, concurrently, military deterrence based on strong cooperation with other NATO states, manifested most recently through Trident Juncture, the largest NATO exercise in Norway ever, and through the deployment since 2017 of 300 U.S. troops to Norway. This contingent is on a permanent training mission and, according to signals from Washington and Oslo, soon to grow to some 700 troops. Military activity is on the rise — in Norway, in the North Atlantic and in the Russian Arctic, but Rowe does not foresee dangerous tension or actual conflict; rather he reiterates how he sees a return to the historically normal. “Every little nation on Earth soon has its own Arctic Strategy and obviously Russia and Norway and all the other Arctic states have to react to this increasing interest. But I regard Russia’s military activity in the Arctic as defensive and guided by fear of perceived Western ambitions in the region. If the terrible should happen that NATO steps out of bounds we can expect a Russian reaction, but the situation in the Arctic today is extremely advantageous for Russia, and Russia’s interests in the Arctic have been the same for a very long time. The Arctic is a treasure trove for Russia and the other Arctic nations and their interests are well protected by the Law of the Sea,” he says. Martin Breum is Danish journalist focusing on the Arctic. His book “Cold Rush” about Denmark and Greenland in the modern Arctic was published in June.